Thanks to online trading, these days nearly anyone can try to make a living by working as a day trader from home. Day trading for a living has a strong appeal for many people since as a day trader you are your own boss. That means you are able to work from home and set your own flexible hours. Plus, unlike a traditional job with a set salary, day trading offers the possibility of a limitless salary since there is always more potential for profit. However, before jumping into day trading as your full-time job, it is important to recognize that not everyone can be successful day trading. Many people who attempt day trading either lose money or make so little that it cannot support their lifestyle. Even for those who are successful, it is important to be able to deal with bad trades and accept the virtual certainty that many trades will end in losses rather than profits. Be cautious about shifting to day trading for a living and don’t allow yourself to be blinded by ambitions of unlimited profits. The shift from day trading part-time to full-time is a major decision with serious personal financial consequences. When day trading full-time, you won’t have a salary from a traditional job to keep you afloat if losses build up. More important, you can actually lose money each day rather than simply not make money – if things go poorly, you could end up having to draw on your savings. In addition, even when you are not losing money, without a salary to supplement your income you cannot add money to your investment account from outside sources. The only way to grow your investment capital is by trading successfully. Make sure you have a successful track record as a part-time trader before even considering becoming a full-time trader. A common question among people interested in day trading for a living is how much money is needed to begin. Unfortunately, there is no one-size-fits-all answer to that question since it depends on every individual’s personal financial situation. There are a few important considerations that can help you determine how much money you need, though. First, make sure you have money set aside outside of your investment capital to last you for a set length of time – typically one full year or more. This money allows you to make the jump to day trading without relying solely on day trading profits in the first year of trading. That in turn significantly reduces the risk of your personal finances being ruined in the event that trading does not work out. By the same token, make sure you are only investing money that you are willing and able to lose. This means that you should always have money set aside for fixed expenses, such as food and rent, outside of your investment assets. Without this money separated from your trading account, a few days of bad trading around the time that rent is due can leave you in a financial crisis. 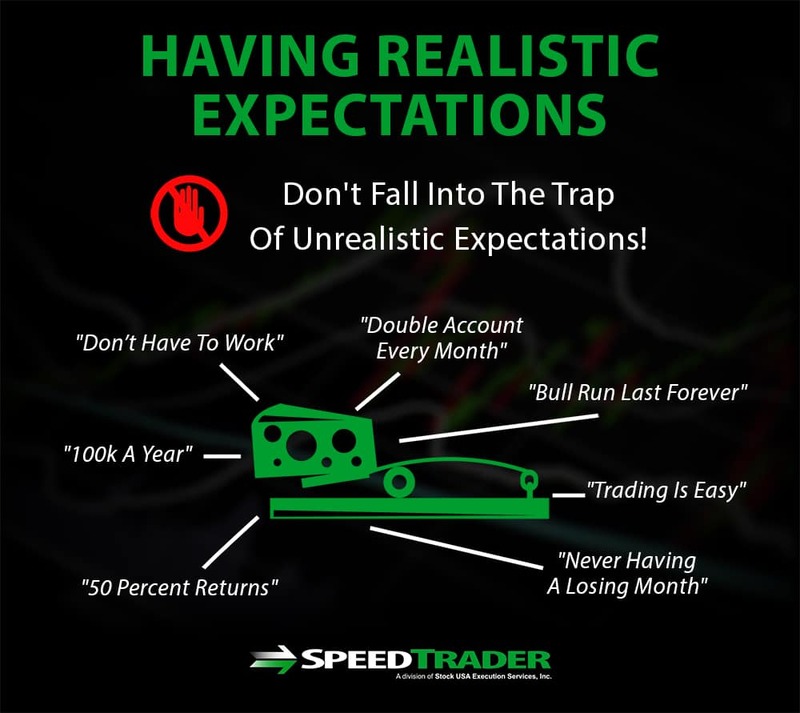 It is also important to be realistic when determining how much money you need to day trade for a living. That means calculating how much you need in income from trading profits to be sustainable, then comparing that number to the percentage gain you realistically expect to make on your initial capital. If you need to make $50,000 per year and expect a 30% return on your capital, don’t expect to jump into day trading full-time with only a few thousand dollars. Trading part-time as a “proof of concept” can help you gauge how much profit to expect and can build confidence that day trading full-time is a real option for you. Who is Eligible to Day Trade for a Living? Although it’s tempting to quit your job tomorrow and declare yourself a full-time day trader, ask yourself whether you are truly ready to day trade for a living and make a sustainable income. Day trading profitably takes experience and practice – and it is much better to gain that experience when you have the cushion of a salary to fall back on. Ideally, you should be trading part-time for at least a year, and likely longer, before deciding to go full-time so that you get experience trying different trading strategies and trading through a variety of market conditions. That time will also allow you to ensure that you are making consistent profits, since as a full-time trader it can be difficult to survive financially through constant boom-and-bust profit cycles. This means that you should be making profits from a majority of your trades, rather than seeing the majority of your profits come from a handful of lucky trades. What is a Day Trader’s Salary? 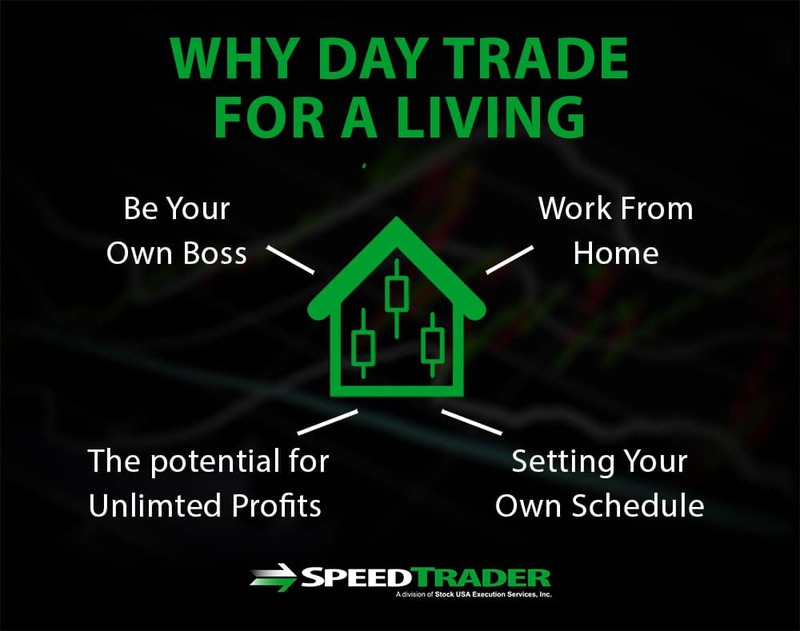 Just like asking how much money you need to start day trading full-time, there is no set answer to the question of how much a full-time day trader makes. Some successful day traders can make $50,000 per year – and be perfectly sustainable at that income level – while a select few traders can make into the millions of dollars per year. There is no cap on profits, but at the same time there is also the potential to lose money over the course of the year and thus take a negative salary. Again, the salary you need or want should guide how much money you need to make the jump to day trading full-time and can also play a role in determining your risk tolerance as a trader. Are you Ready to Become a Full-Time Day Trader? Chances are, you’ll know when you’re ready to make the leap to full-time trading. If you’re unsure, it’s probably not the right time. If you’ve been trading profitably for a long period of time (over a year), full-time trading may be an option. If you’re still uncomfortable with the idea, take it for a test drive. If your job allows vacation time, take a week to see what it would be like to trade from home everyday. Day trading for a living is inherently attractive since it allows you the opportunity to be your own boss while making a theoretically unlimited salary. However, it is critical to gain trading experience and prove yourself as a successful part-time day trader before making the jump to full-time trading so that you do not find yourself in an unsustainable financial position. Always be cautious when considering whether day trading for a living is right for you, keeping in mind that a negative salary is a real possibility. With those caveats in mind, day trading provides a consistent income for numerous people and can be an extremely lucrative way to make a living.